Workshop instructing and custom sewing parkas. She has enjoyed the leisure of retirement, travelling, sewing, needle­ work and music. Norma Patricia still lives inAmeliasburg, ON, where she devoted many years to her nursing profession. She has been very active with 4-H Clubs and Women's Institute. Her children, Leanne, Darrell, Heather and Laraine reside in Belleville. She now enjoys her grandchildren: Leanne's children, Meaghan (August 4, 1994) and Bradley (March 25, 1997); Heather's child, Lauren (May 13, 1999). Irving still resides in Winnipeg and continues to work at the University of Manitoba, being responsible for the Environmental Health and Safety Department since 1986. Irving has been very active in Professional organizations and Epiphany Lutheran Church. His children, Deanne and Jeff, still reside in Winnipeg. Karen Adina still resides in Markham, ON. She is employed at Scarborough General Hospital in the Cardiac Unit as a medical transcriptionist. Karen continues to enjoy her needlework and crafts. Her children, Kristen and Steve still reside in Markham. Albin Ernest, son of Johan and Ida Gustafson, was born on January 27, 1892, on NW 16-18-17W in the Scandinavia area. In 1929, Albin married Alma Amanda Svenson in Brandon. Alma was born in Middle River, Minnesota, on September 27, 1895, eldest child of Olaf and Minnie Svenson. Albin passed away on June 27, 1968, at Clear Water, BC and is buried in the Erickson Cemetery. Albin and Alma were members of the Erickson Lutheran Church. 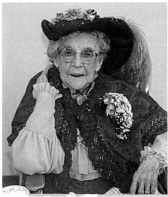 Alma resided at the Sandy Lake Care Home from March 1985, until her death on Febrnary 20, 1998, at 102 years of age. Alma was buried beside her husband, Albin, at the Erickson Cemetery. Their children are John and Jane. John (see Gustafson, John and Leona). Jane Alma was born on SE 28-19-19W in Crawford Park District on July 11,1934. On August I, 1959, Jane and Alvin Austin were married at the Bethlehem Lutheran Church, Erickson, MB. Jane and Alvin continue to reside at Port Moody, Be. Jane retired in December 1999 and Alvin is in Real Estate. Their three children are James, David and Sandra. James was born in Winnipeg on July 19, 1961. He is single and is a heavy equipment operator in the Vancouver area. David was born on September 30, 1963, and is employed at an aircraft company. He and his wife, Prescila, are expecting their first child in April 2000. They reside in Burnaby, Be. Sandra was born on October 14, 1967. Sandra and her husband John MacKinnon reside at Port Coquitlam, Be. John is a supervisor at an air craft company. They have a son, Ben, born on April 20, 1999. Harold A. (Harley) worked for Manitoba Hydro in Winnipeg. He and his family later moved to Selkirk, for 9 years, to be closer to his employment. He retired from Hydro in 1992, and he and his wife, Janet, now live in Winnipeg. Harley is enjoying his retirement, especially curling and golfing. He and Janet enjoy spending time at their daughter's (Nancy) cottage at Lake of the Woods. Harley and Janet have three children: Cheryl, Brnce and Nancy. In 1983, Cheryl was 23, Brnce 21, and Nancy 19. Cheryl completed her master's degree in Psychology in Fargo, North Dakota in 1984. Her first job was in Winnipeg where she worked with research at the University of Winnipeg. In 1985, she married Louis Deviaene. In 1987, their child Lise was bom. Unfortunately, their marriage broke up. Later, she married Jake Marks and a son was born. Cheryl remains in Winnipeg and does some work on her own and contracts out with other companies in the field of Psychology, which she loves. In 1998, Lise is 11 years old and Jake is 8 years. Cheryl is into Yoga in a 'big' way. She and Jake enjoy playing the Japanese drnms and have a fondness for Sushi at a favorite Japanese restau­ rant!